Shopping for ingredients on this one was a lazy and expensive proposition. Lazy because I decided to buy ready-made crust. Expensive because of the liqueur that I only needed a couple of tablespoons of. The pie calls for 1 1/3 cup whipping cream 4 egg yolks, 3/4 cup super-fine sugar (what is super-fine? 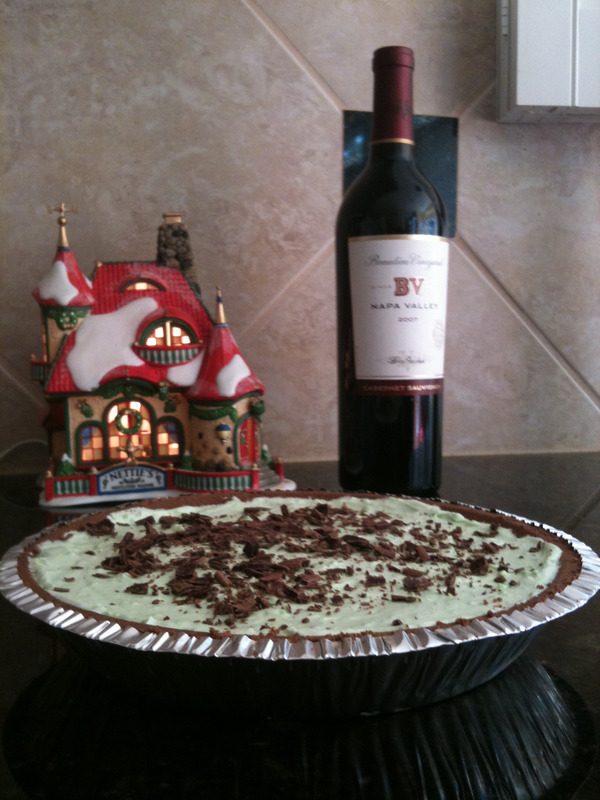 ), 1 tbsp creme de menthe, 1/3 cup creme de cacao, and 1 1/2 tbsp gelatin. you whisk 1/3 cup whipping cream, gelatin, yolks, liqueur, and super-fine sugar over medium low heat for about 4 minutes. Pour into metal bowl and set in a larger bowl that’s filled with ice and cold water. That gets the mix to thicken. Stir periodically for about 10 minutes to set. Pore the remaining whipping cream into a bowl and with an electric mixer, mix till cream is stiff. Fold whipping cream into the cold mixture until everything is well combined. Pour into crust and refrigerate for three hours until set. Garnish with mint chocolate flakes.